Holy Jamoly, it has been a whole month since I wrote a blog post. I have a pretty good excuse. Business was booming at More Love Mama. I've been sewing up a storm. Most days I went home from my first job at school and sewed for 3 or 4 hours in my second job at home. So I simply didn't have any more hours or energy to write a blog. I had some many great ideas of things I wanted to write about. So I guess I'd better hurry up and catch up before all my ideas drift back out of my head. Today I woke up at about 7:30. My bladder wouldn't let me sleep any later. After leaving the bathroom I could hear the girls playing quietly in their room. No one was screaming in agony or calling my name so I let them play. This was a bad plan. 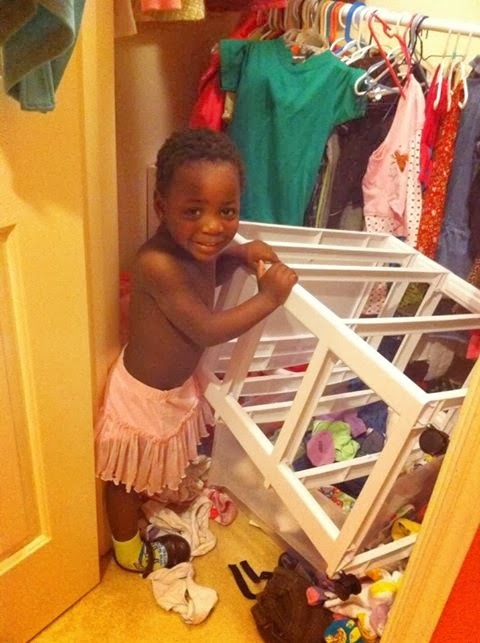 A few minutes later Brian went in and discovered they had ONCE AGAIN gone into the closet, emptied all the drawers of the dresser and dragged dozens more pieces of clothing off the hangers. Uggg! It was too early for such a moment of chaos. Louise, where are your pajamas? And your pull-up????? However, one of my goals for this holiday vacation time is to purge my house of a great deal of clutter. Because of course, on Christmas Day, we'll be adding a whole new pile of crazy clutter to our mess. So Louise forced me to start in her closet. I managed to sort out a whole diaper box of clothes for the attic. Now I just have to track down the door knob cover that she pried off during her break in and duct tape it back to the door!!! I then moved onto shoes. In a house with 8 people, shoes are one of the great and annoying challenges of our day. If every person has just 2 pair (which of course is closer to 4 or 5 per person) and all those shoes end up floating around our living room at the same time, it leads to a landmine effect of highly irritating proportions. So after lots of pairing and purging I was able to sort out a whole box of don't fits or won't fit by the time summer comes back around shoes. Ahhhh, I love to box things up and send them to Attic Land!!! I asked Manny how this happened and he said, "JoJo did it!" Hmmmmmm??? Sorting and eliminating lots of children's books. I never dreamed we could have too many books in our house, but we do! And boy howdy, there are some kids books that never should have been published. We need them out. Clean and organize my bedroom and closet. Convince Brian to build a dutch door into your kitchen. The doggy gate we currently use it not cutting it. Our little burglars are masters of the break in! Clean and re-organize our school area in the kitchen. There are school supplies strewn everywhere and this week Kat managed to steal a dry erase marker and graffiti all over our living room carpet. Oh she is so cute! Actually get all the boxes of my de-cluttering success out of the garage and up into the attic. So I've written it all down for the world to see so that all of you will hold me to my list! I'll post a few before and after pics if I have any success! Have a great Saturday and see you tomorrow for Day 2 of the Fourteen Days of Christmas Vacation!